Holy Molé is a Flash to HTML5 conversion using the Phaser HTML5 game framework. What better medium to test your ears than a bunch of singing Mexican Moles? 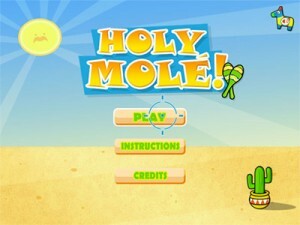 In this game, you will hear the main mole (Juan Direction) play a series of notes on his guitar. These same notes will then be sung one by one by a group of lesser moles, floating from balloons. However, one of these singing moles will sing a wrong note. 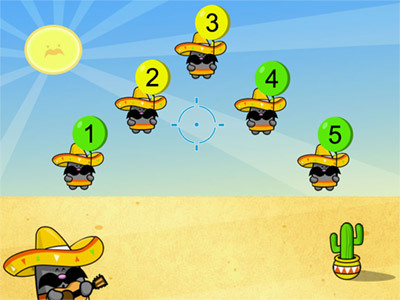 It is your job to spot which mole it is, and pop his balloon so that he falls to the ground as punishment (only the best moles can sing in the Holy Molé Ballooning Mole Choir!). You have 10 seconds in which to decide which mole is wrong and shoot him down. The quicker you shoot him down, the more points you get. 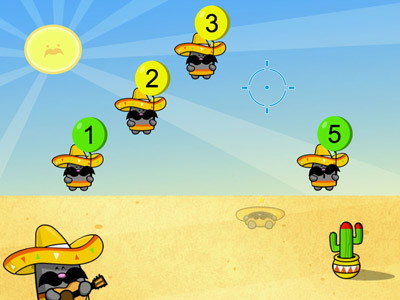 This entry was posted in ANDROID, Android Games, EDUCATIONAL GAME, HTML5, HTML5 Games, iPad Games, iPhone Games, PHASER and tagged cross browser game, Educational game, Flash to HTML5 conversion, music game, Phaser. Bookmark the permalink.